A few recently published studies have raised concerns about the safety of using CRISPR in the clinic. While the results are important, keep in mind that it’s hard to draw conclusions based on those findings. More study is warranted. We strive to stay at the forefront of any potentially groundbreaking therapy for our young patients, including gene therapy using the CRISPR-Cas9 platform. This gene-editing strategy allows scientists to cut DNA at specific locations in the genome and make targeted modifications with the ultimate hope of correcting disease-causing mutations. Since the original proof of concept papers were published in 2013, a flurry of research has been conducted in both academia and industry, and many groups are working hard to bring CRISPR-Cas9 to clinic. CRISPR-Cas9 therapies are especially exciting because they are not limited to one disease. Additionally, CRISPR-Cas9 therapies have the potential to correct disease-causing mutations at the source—the patient’s genomic DNA. CRISPR: Best in pediatric diseases? Once a CRISPR-Cas9 therapy is shown to be safe and effective for a given disease, children would especially benefit from the therapy. Many diseases develop and progress because of accumulating disease-associated damage. The hope is that if we can correct these genomic mutations early in life, it will prevent the effects associated with a lifetime of accumulating damage. At present, we at St. Jude are focused on conducting basic science research in the area of therapies for treating hemoglobinopathies, including sickle cell disease and beta-thalassemia. Work done in the laboratory of Dr. Mitch Weiss used CRISPR-Cas9 gene editing to ameliorate the disease phenotype (sickeled cells) of blood cells from patients with sickle cell disease. While further studies are required to optimize this editing approach, the Weiss study provided proof of principle for a potential therapeutic approach to treat common β-hemoglobinopathies. A few recently published studies raised concerns about the safety of using CRISPR in the clinic. In back-to-back papers in Nature Medicine, the Karolinksa Institute and a group from the Novartis Institutes for Biomedical Research published papers showing that the programmed DNA breaks created by CRISPR-Cas9 do stimulate the p53-mediated DNA damage response pathway leading to cell cycle arrest As a consequence, cells without functional p53 may be selected for and could potentially lead to cancer. Just this month, a study by the Wellcome Sanger Institute published in Nature Biotechnology, found significant mutations, including large DNA deletions and complex genomic rearrangements, have developed after CRISPR-Cas9 editing. Although each study was scientifically sound, none of the results from these studies were all that surprising. Traditional CRISPR techniques rely on DNA breaks to create the desired modification. It is not surprising that a DNA-repair pathway would be triggered by CRISPR treatment. Moreover, it is essential that studies calling the safety of potential therapies into questions should be conducted under clinically relevant conditions. The study by the Wellcome Sanger Institute was not conducted under such conditions in several key ways. First, the Cas9 nuclease was constitutively expressed, which would never be done in a clinical trial. Second, the study used two mouse cell lines and a differentiated human cell line that can be cultured in vitro indefinitely. None of these cell types would be used in a clinical setting. Moreover, the reagents and transfection methods used were of research grade rather than clinical grade. This is not to say that the results are not important or relevant, it’s just that until more clinically relevant data is presented, it’s hard to draw conclusions on how the data will affect the potential use of CRISPR-Cas9 for therapeutic applications. DNA double-strand breaks in other cell types may not have the same genomic outcomes. Further studies on safety and specificity are definitely warranted. 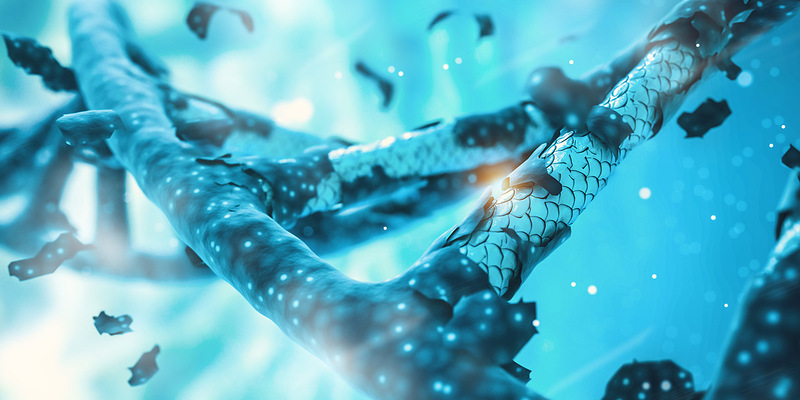 The ability to make genome edits without creating potentially dangerous DNA double-strand breaks is a great idea and could potentially have reduced risks. One such platform, originally described by Dr. David Liu’s laboratory at the Broad Institute, is called base editing. Base editing allows for one or a few specific base pairs to be altered without the creation of a double-strand break. This technology also uses the CRISPR-Cas9 system to target the base editor proteins, attached to a Cas9 protein, to specific sites within the genome. In this case, the capacity of Cas9 to create double-stranded DNA breaks has been eliminated. Currently, base editors can edit the base pair of interest and potentially several of the neighboring DNA bases. At present, the base-editing technology is relatively new, and further research is needed to determine the associated risks and narrow the editing window. Additionally, because base editing is limited to one or a few base pairs of DNA, larger modifications are not currently possible with this technology. CRISPR-Cas9 is a game-changing technology. It has allowed us to do things that will continue to have a major impact on the future of science and medicine. The field has rapidly advanced, and we are already seeing clinical trials based on these discoveries. Shondra Pruett-Miller, PhD, directs the Center for Advanced Genome Engineering at St. Jude Children’s Research Hospital. View full bio.